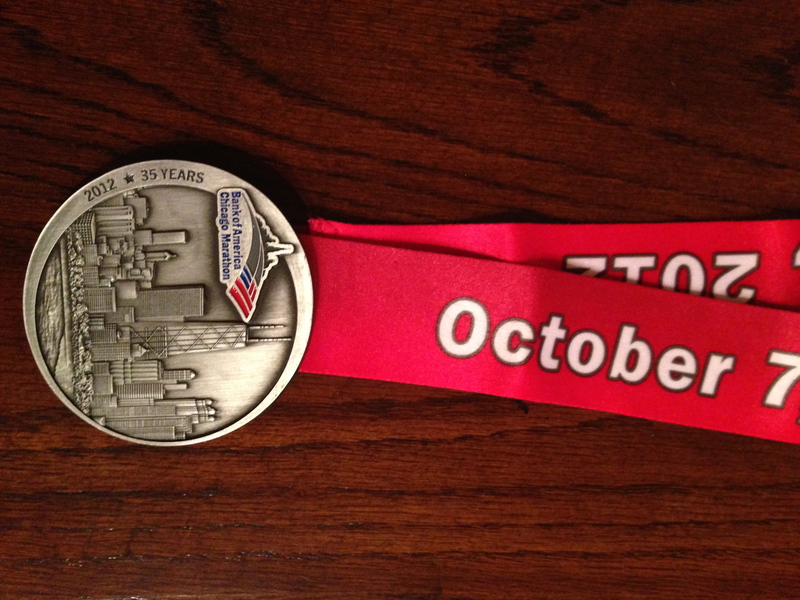 Race Takeaway: I finished and sometimes that’s all that counts. 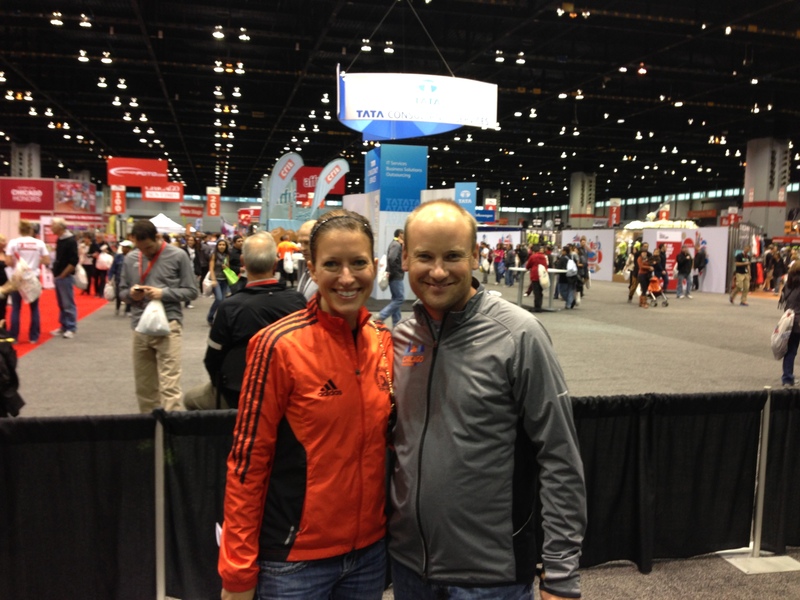 Sunday morning Rob and I got up at 3am to run the Chicago Marathon. We both slept well, got our things together and met up with Drew with no problem. It was marathon business as usual for us. The only snafu was the coffee shop we typically relaxed in hours were not aligned like they have been in previous races, they were closed. It was freezing out, upper 30s at 5am, but luckily in Chicago there is always a coffee shop just a few steps away so we found a new hangout. It was going to be a chilly day, but luckily only 10mph winds from the NW. I wore capris, long sleeves, gloves, and hat. I also wore a throw away sweatshirt while we waited in our start corral. Before I knew it we were off. I was on my planned pace easily and miles were clicking by. I noticed a tinge in my right calf, but nothing alarming. Unfortunately by Mile 9 what started as a tinge turned into full on cramp in my right calf and tightness in my right hamstring. I knew that the next 17 miles would be painful and my new plan would be just to finish. My pace slowed with each mile as the tightness became more painful. By mile 19 I needed to make a potty stop, but there were no worries on my time since my goal had switched to just finishing. The last few miles were very slow and I just willed my way to the end. 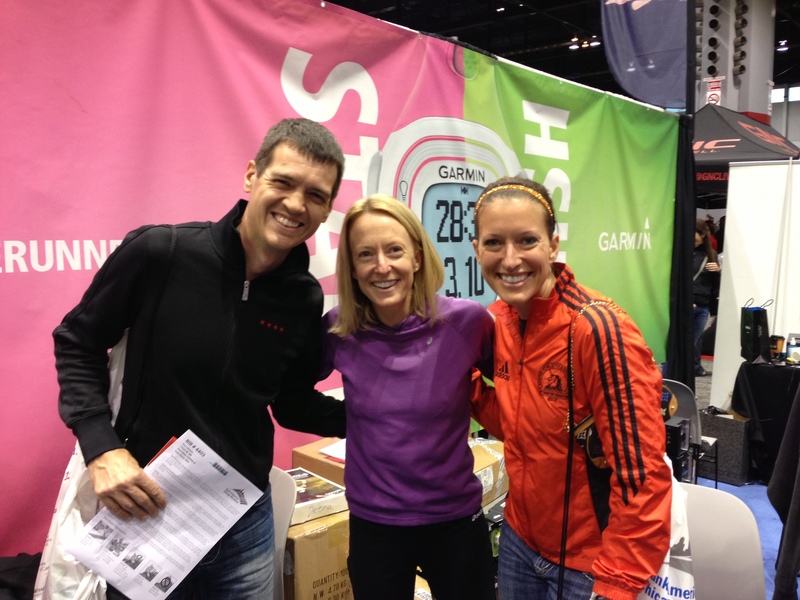 I did run into a fellow runner from my hometown and got to chat with her as made our way through the last 800 meters. It wasn’t my day and I knew early in the race and managed through it. I wasn’t disappointed as I did the best I could with the situation. It’s another marathon finished and that does count for something. Rob had a good race, finishing with a 3:38:50. Chicago Marathon spectator signs are the best. I love all the creativity. Balloons, pictures of peoples faces printed up huge, and the hilarious signs. Some of my favorite signs during the race were “Hurry Up We Are Freezing!” and “<Insert Name> I’m Pregnant”. Drew said he saw one that said “Hurry up the Bears game starts at 3:15pm!”. 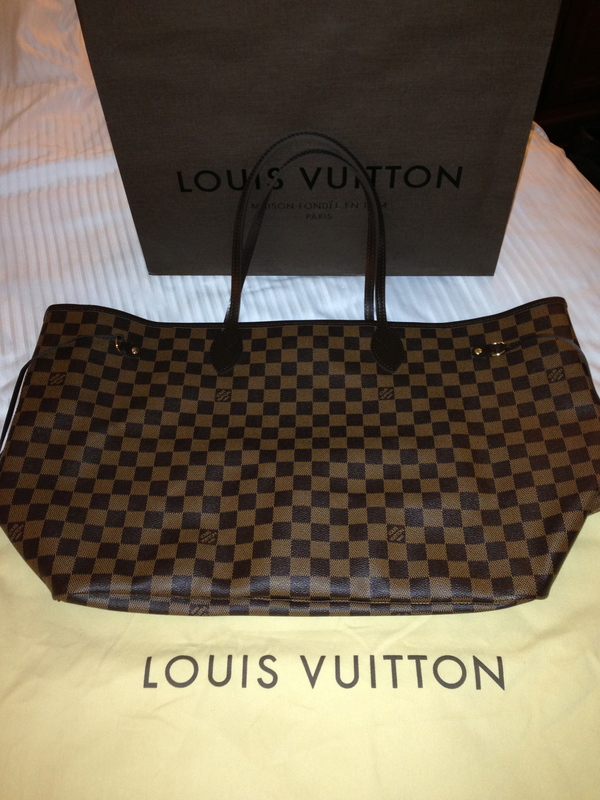 Oh and I still had time for shopping! 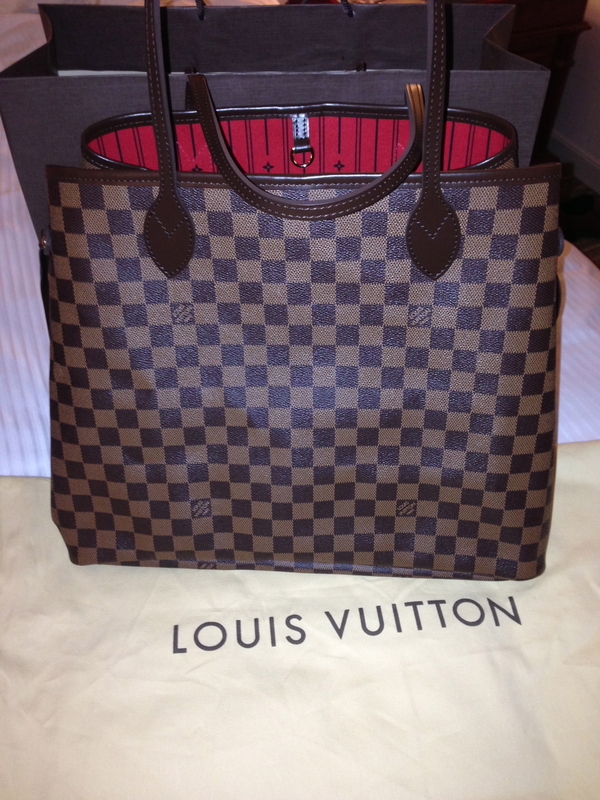 I got the Louis Vuitton Neverfull GM Damier 😀 It’s a huge purse that will be great for travel! I love it!! With the sides synched in. 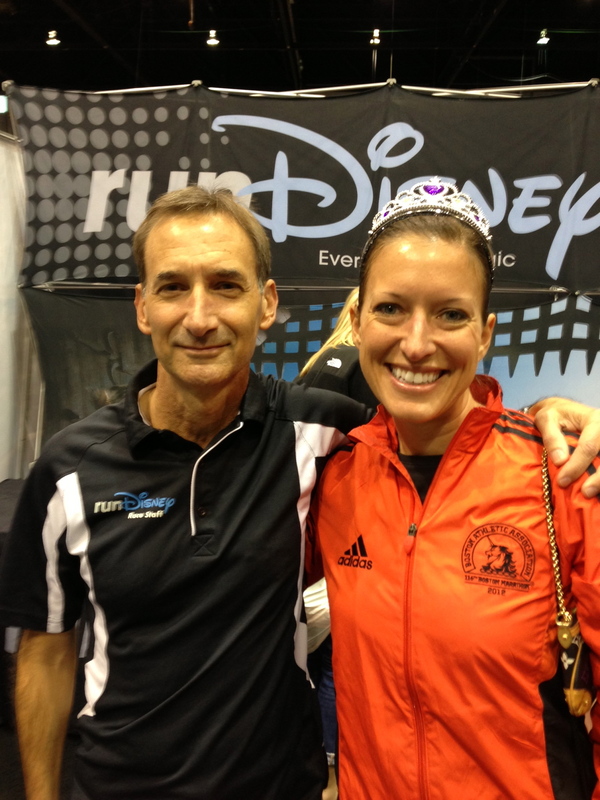 Categories: Chicago Marathon, Marathon, Race | Permalink. I tried out the chia seeds! I put a tablespoon into my blended green monster. They start out looking like poppyseeds and then they absorb the moisture in the smoothie and puff up a bit. They have no taste that I noticed and weren’t too annoying (not like a strawberry seed can be in a smoothie). 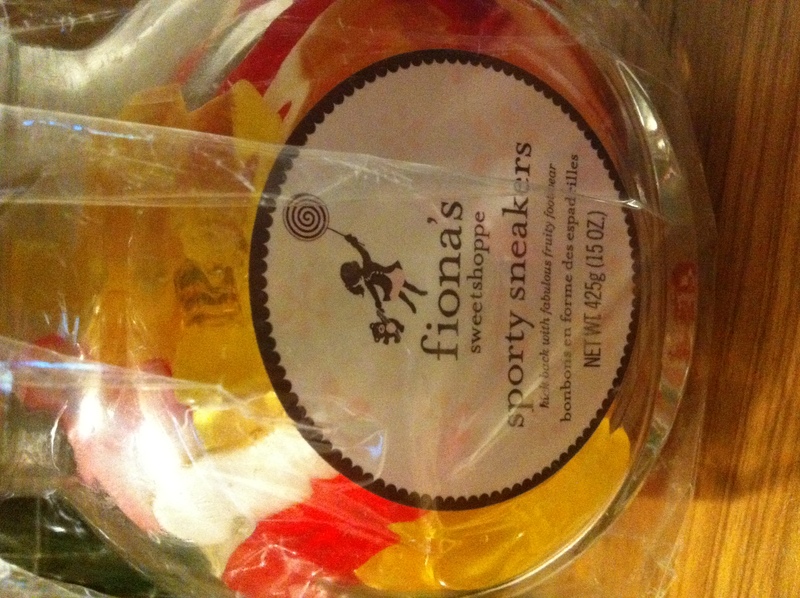 I didn’t notice any instant benefits from it, still I will keep them as a part of my smoothie and yogurts. Also, I got us registered for some races including 2012 Chicago Marathon and can you believe the race is already SOLD OUT?! How amazing!! 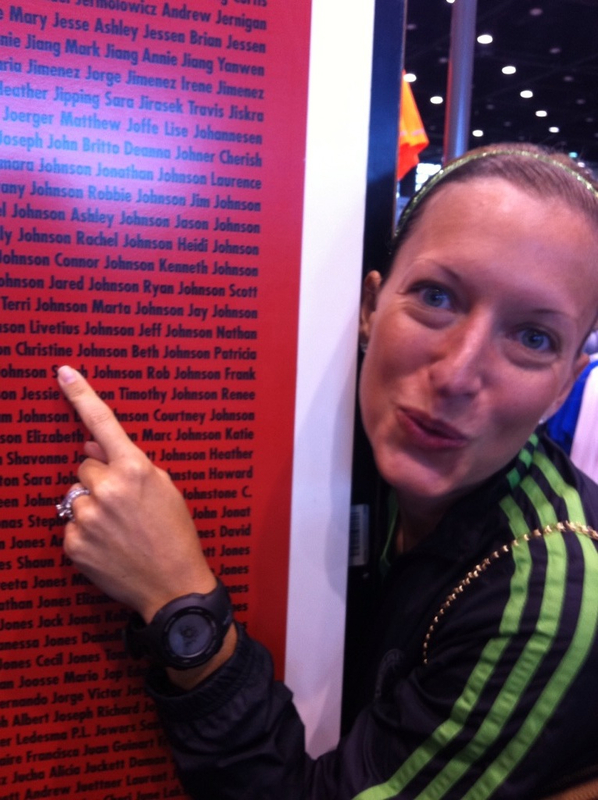 I’m so excited to get to race Chicago Marathon again and I’m happy that so many people are interested too! We also got registered for the 5K during the Boston Marathon weekend! We didn’t run the 5K last year when we were there for the Boston Marathon so we definitely wanted to this year as a fun run prior to the main event! 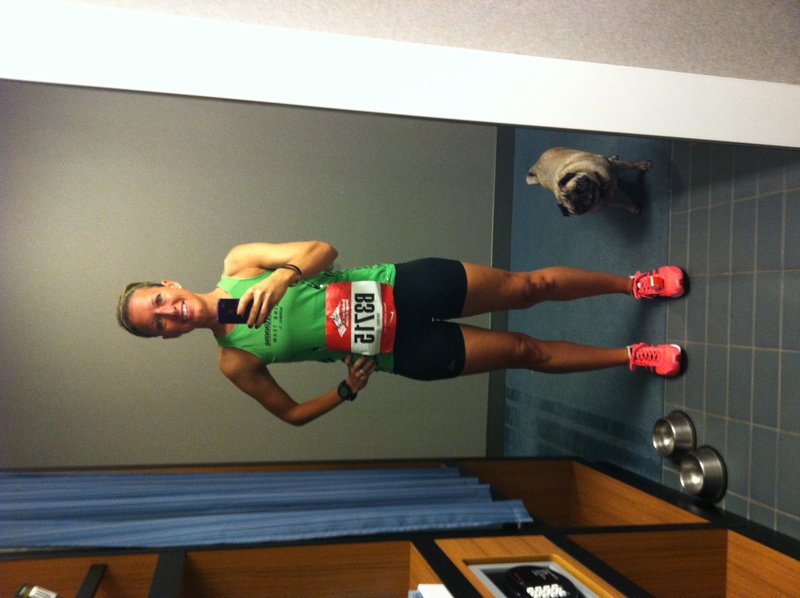 Categories: Boston Marathon, Chicago Marathon, Marathon, Stats, Training | Permalink. The race didn’t go as I had hoped, but I will start from the beginning. We awoke at 3am and I felt fully rested. Other than lingering tightness in my hamstrings I was feeling really good. My stomach was also feeling good, but no magic happened in the AM which is a sign I will likely need to stop mid-race at some point. For fuel I had one Hammer Bar and one serving of Perpetum. My race day outfit. No throw away clothes needed, it was 50ish degrees with temps around 67 when we finished, high for the day was in the 80s. Coco is all race ready too. 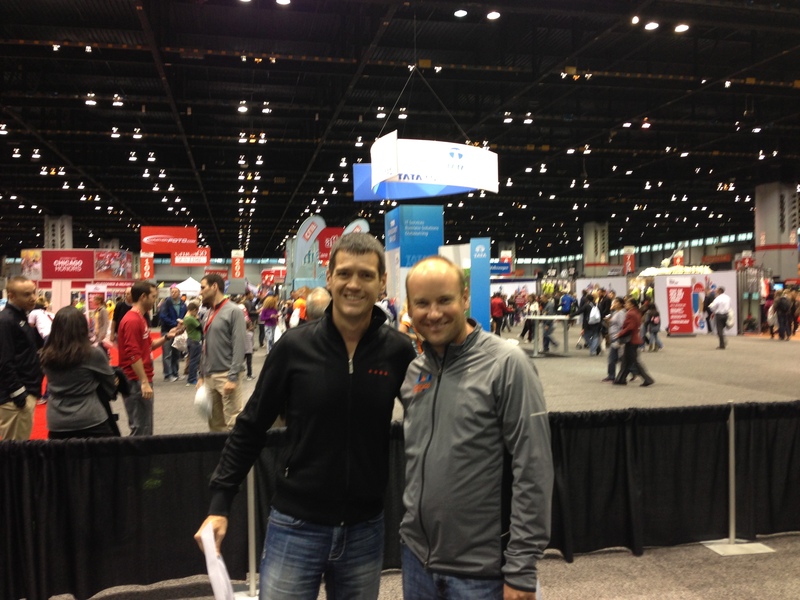 We had no problem getting down to the start and meeting up with Drew. We parked in millenium parking garage at 5am before it gets crazy and then we wait it out at a local coffee shop. If you buy a small coffee you can chill and use their bathrooms. Around 6am we made our way toward the corral area. By 6:30am we made it our respective corrals and waited in line at the porta potties one last time. Always good to go a 100 times if you have the opportunity. By 7:20 we are in the corrals and the 10 minutes fly by and we are off. The weather felt perfect and my legs felt good. I was executing my pace as I had hoped. I hit 5K at 24 mins, 10K 48 mins, 15K 1:12 mins….like clock work the miles click by as planned and I feel really good. By Mile 11 I know I will need to make a pit stop. At least my stomach isn’t rumbling with violence and it’s a normal gotta go feeling. I make my pit stop, putting my half marathon at 1:43. I wanted to be at 1:39-1:40, but I still feel good about a potential PR or at least being in the vicinity of my previous time since I had a pit stop last year as well. I see our friends cheering which was a fun surprise. By around mile 15 I get the gotta go feeling again, now I’m frustrated. On the positive it wasn’t the gut wrenching feeling, but another just gotta go. I’m annoyed to have to stop again, but I know it’s something I won’t be able to ignore. Now my pace is really off. I set back out to get in the zone and things get worse from here. The stopping doesn’t help my hamstrings. They feel REALLy tight. It’s mile 16 and I already feel a limited range of motion, shooting pain and I know that the next 10 miles are going to take forever. Each mile the passes from this point forward the pain increases, my range of motion limits and I’m completely frustrated. My movement is more a shuffle than a run and I feel soreness in my feet and other locations and my body is compensating with my awkward stride. I’m now enduring this race. Around mile 19 or 20 a man comes up to me saying “Fly Runner” and introduces himself. I’m sorry I now can’t remember his name, so if you are reading this please comment! It was so nice to chat with someone at this moment since my body feels completely broken. I had become so disappointed in myself. It definitely helped to have someone take my mind off of it for a bit. He spots a loved one and goes to the side to get a moment with them and I shuffle onward. I hope his race went well and he enjoyed the moment. I was ready to be done, ready to say today was not my day and move on to the next. I finish and am absolutely unhappy with how things went, but there is nothing more I can do. I make my way to the family meet up area and find Rob. I burst into tears hugging him saying how long the 10-11 miles feels when all I wanted to do was to go home because I was hurting so much. He comforted me and told me it’s another one done and that there are no promises that the marathon will go well, it’s a long amount of time for many things to happen. He reminds me that it’s another one done and there are many more ahead. Rob finished 3:33 and is feeling pretty good, just the usual soreness that comes with a marathon. We meet up with our friends, clean up and have some lunch at Palmer House while we await news of Drew’s finish. Drew had a tough race as well, but finishes in 5:21 and adds his second marathon (two in the same year) under his belt. We meet up with Drew, Carrie and his family to hear about his experience. 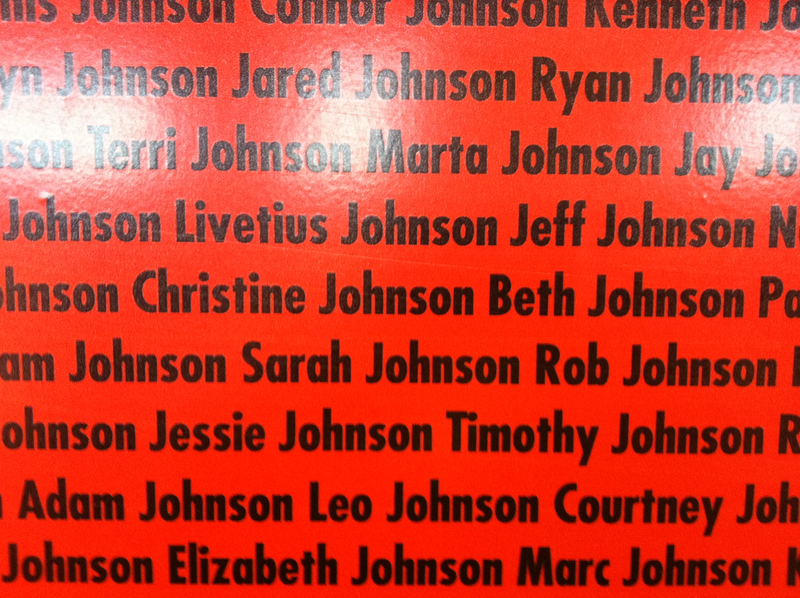 His family was able to see him multiple times on the course which had to be so awesome! I’m not the best at putting these types of races in perspective. I know that running means getting disappointed sometimes and facing issues. Maybe I won’t ever PR again, who knows, but that won’t stop me from trying. I love running and I want to do this forever. So I have to just focus on recovering from my soreness and keep working on my strength and flexibility as I set my sights on the next set of races. 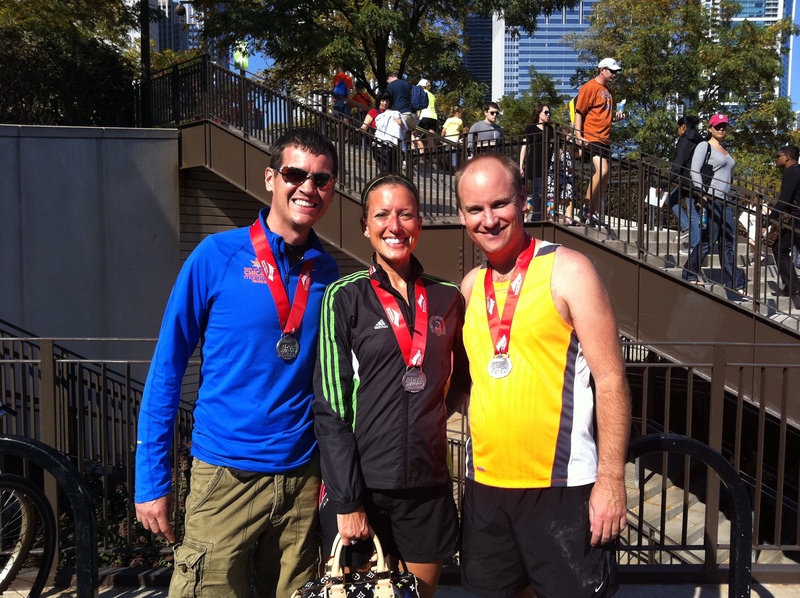 Categories: Chicago, Chicago Marathon, Marathon, Race | Permalink. 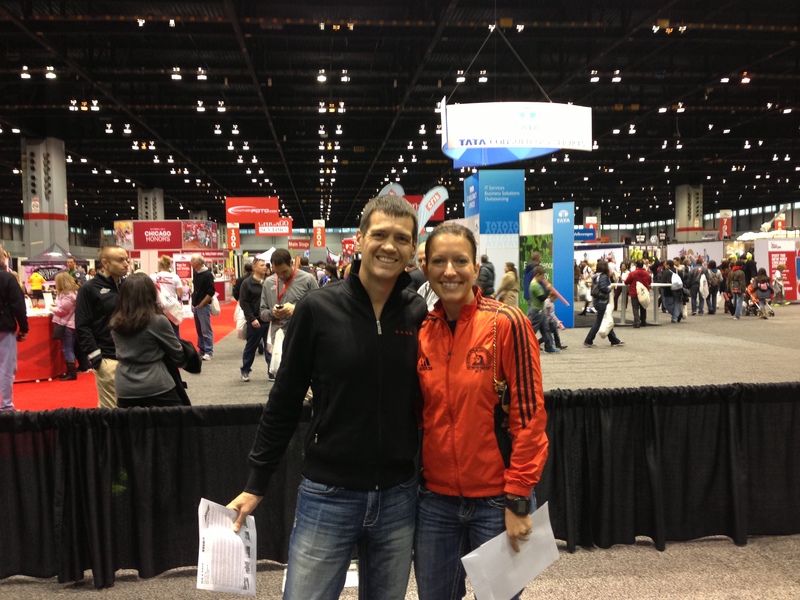 Friday Rob and I went to yoga, had lunch and then went up to the 2011 Chicago Marathon Expo. The expo like past years did not disappoint. 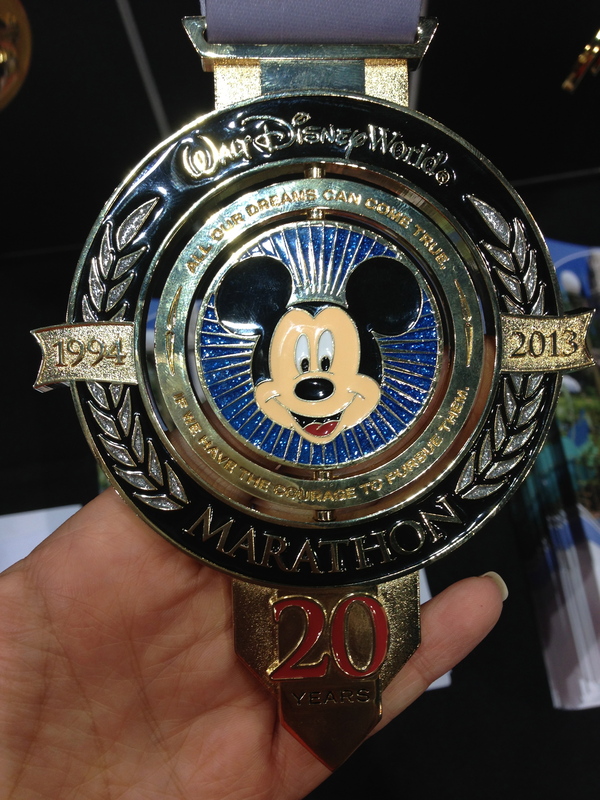 It was easy to get around, there were lots of merchandise options, and the vibe was all marathon. 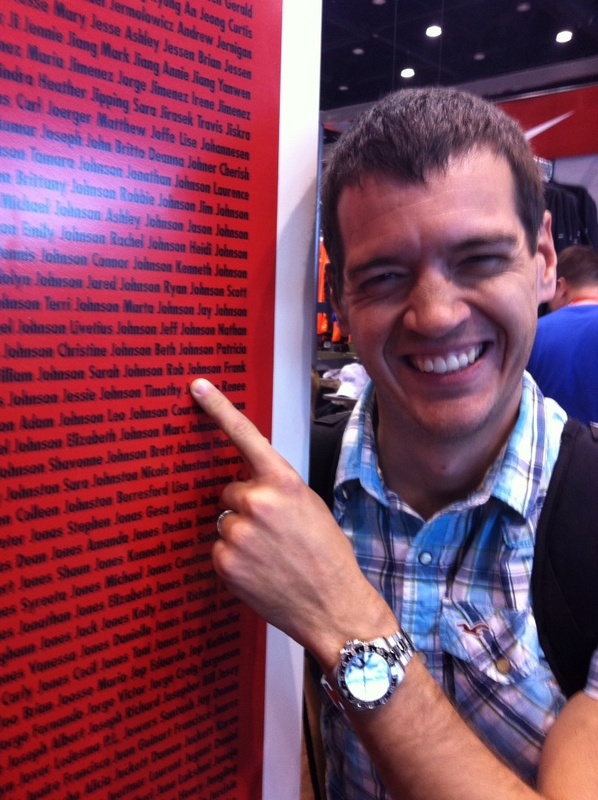 Rob and I got our bibs and made our way to the Nike store to get some official gear. We both went for the track suit top in black and Rob also got a very soft bright blue long sleeved 3/4 zip running shirt. 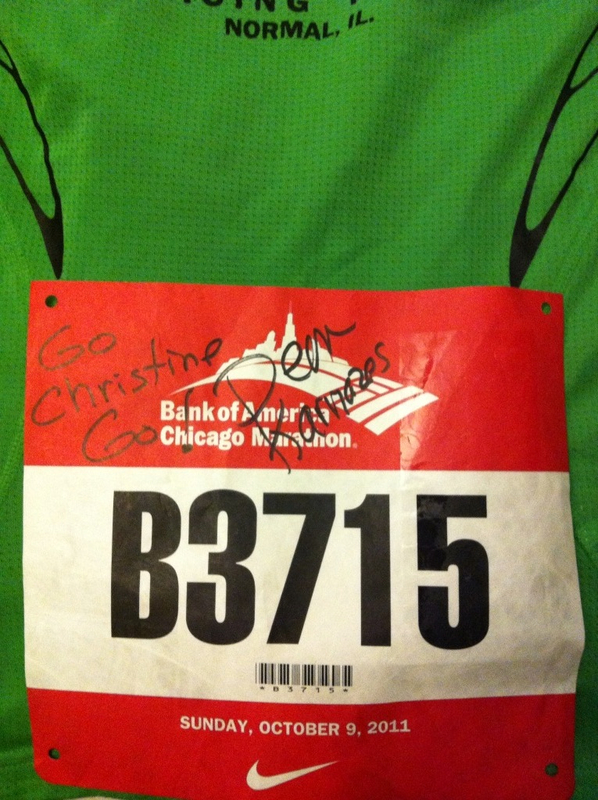 Afterward we got the Chicago Marathon shirt that comes with the bag and I have to say it was a bit of a let down. White? And the design wasn’t stellar. Nothing I would go out of my way to wear so good thing we bought some gear. 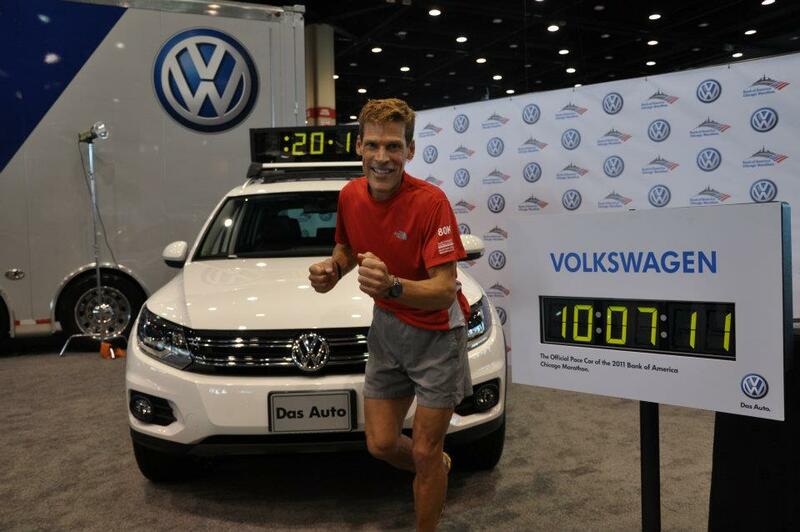 While walking around we happened upon one of our running idols and legends, Dean Karnazes signing autographs and taking pictures at the VW booth. 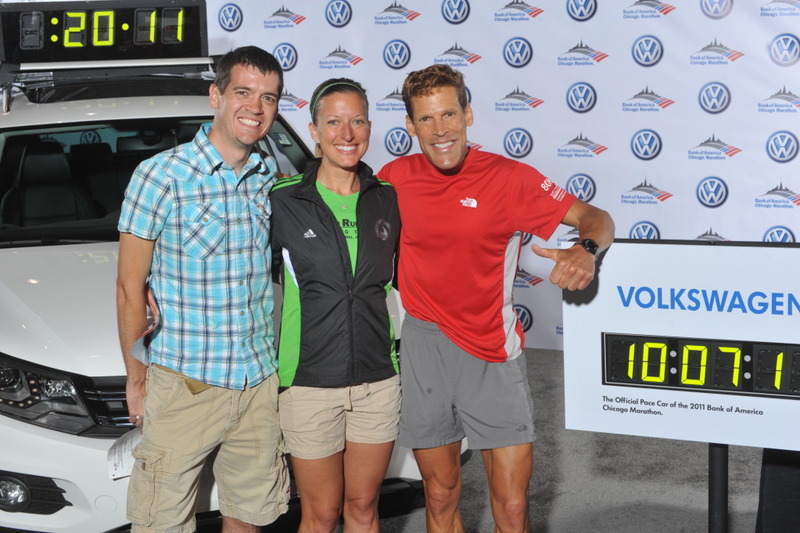 The VW booth was strict about not taking personal photos and instead had a professional photographer on site. They said they will upload a professional photo to a site that you could then download/share/print, score! Dean is seriously so kind and gracious. 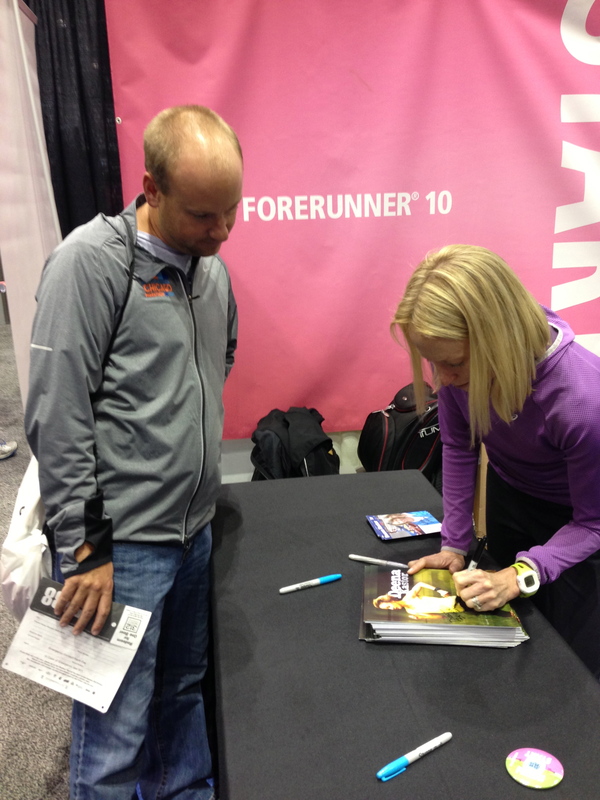 He seemed genuinely interested in chatting with us and signed each of our bibs. Then we had our picture taken. 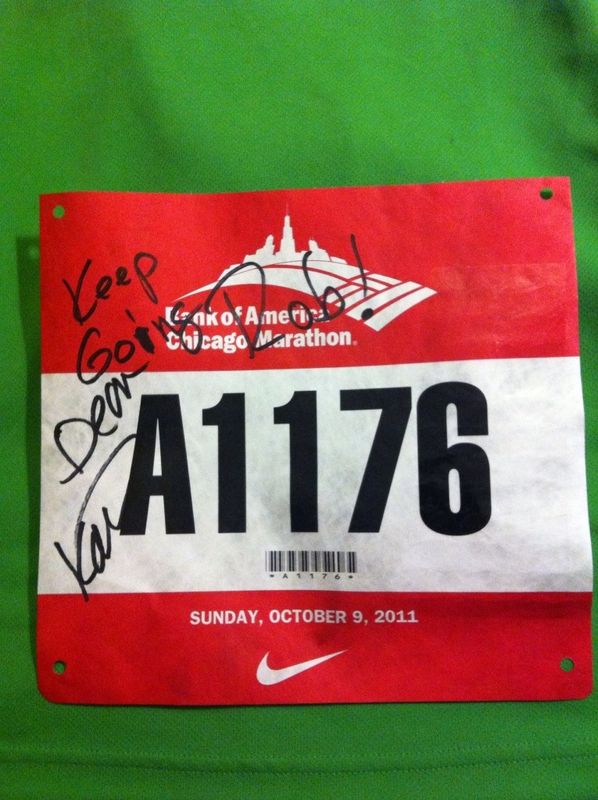 Here is a picture of our bibs signed by Dean. After we left Dean we were figuring out what to do next when a man came up saying “Fly Runner”. It was Omar! He was super nice and I got a quick picture with him, it may be a bit blurry. Omar thanks for reading my blog and for saying hi! 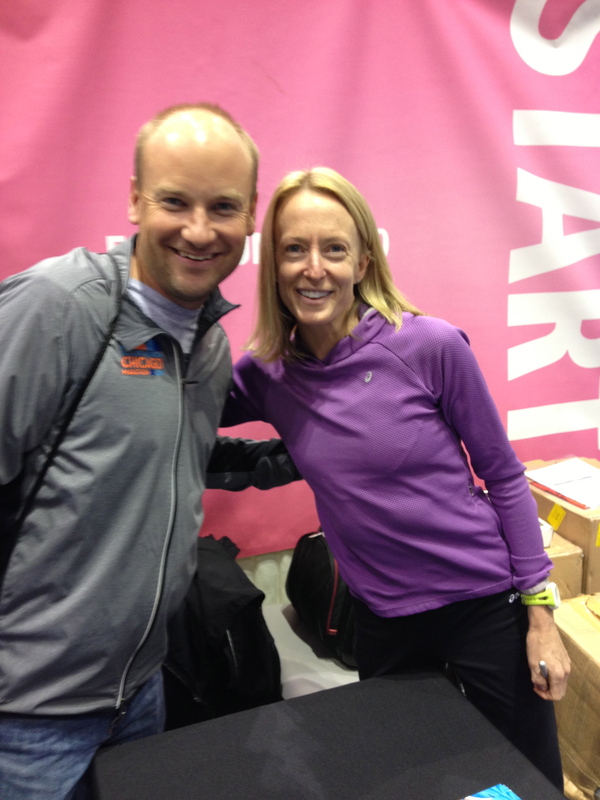 I hope you had a good race and weekend! 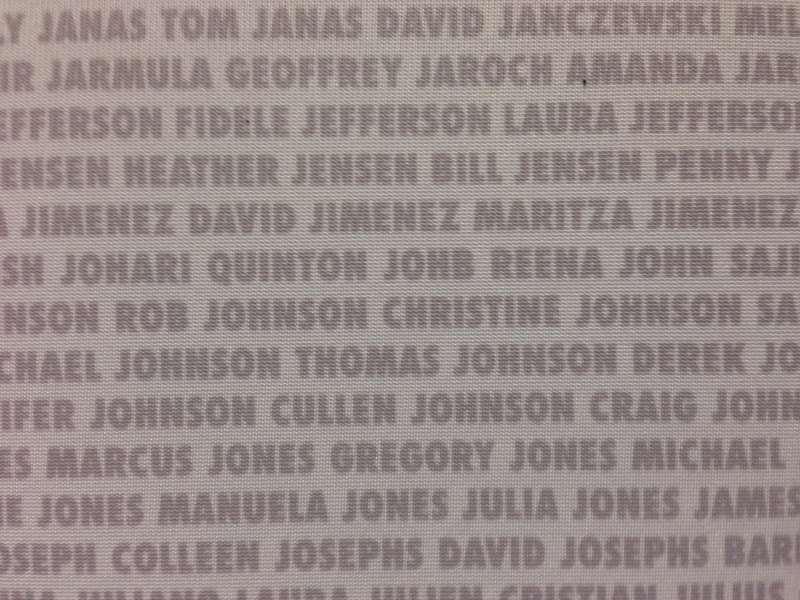 Up next Rob and I found our names on the Nike wall. 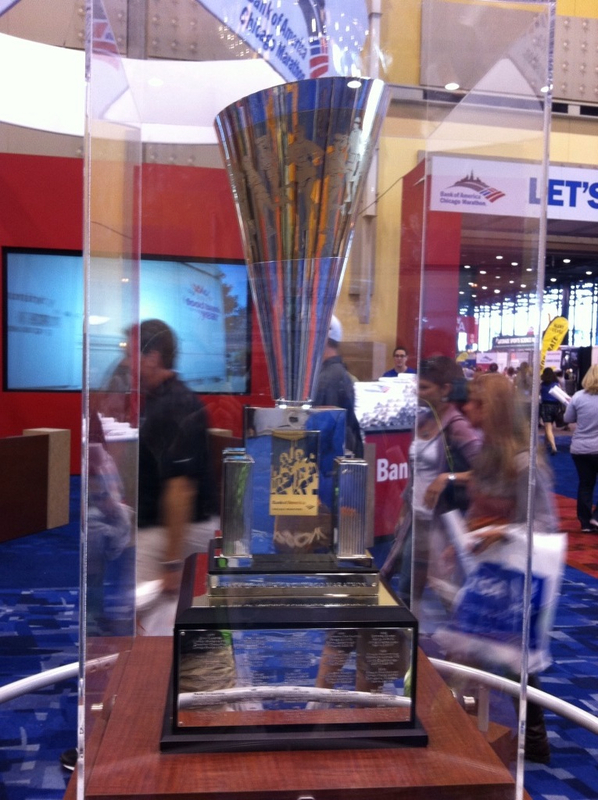 On our way out we noticed the Chicago Marathon trophy on display, it is quite impressive! After the expo we went out for a nice 5 mile run by the lake. My hamstrings have been tight for over a week and this run I could still feel it. I’ve been doing yoga, foam rolling, biofreeze, and massage. Sometimes these things just take time and I’m out of time. It was at least improving. So I just hope for the best that another day of rest will bring enough relief to make through the race in one piece. We cleaned up and went to dinner at P. F. Chang’s, dessert at Pinkberry, and grocery shopping at Trader Joe’s. It was a perfect day! 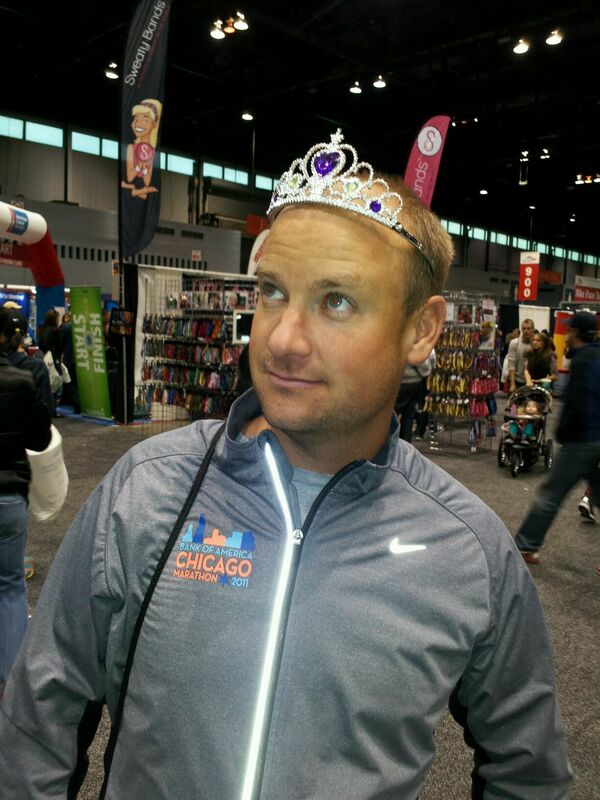 Categories: Chicago, Chicago Marathon, Expo | Permalink.